Oh my dear friends, its been too long. I have pending posts in my journal, waiting for this busy student to put them online. It feels like yesterday since I was home with my family, but it is already the end of August, marking the end of my First Year in school. Oh my where has time gone. 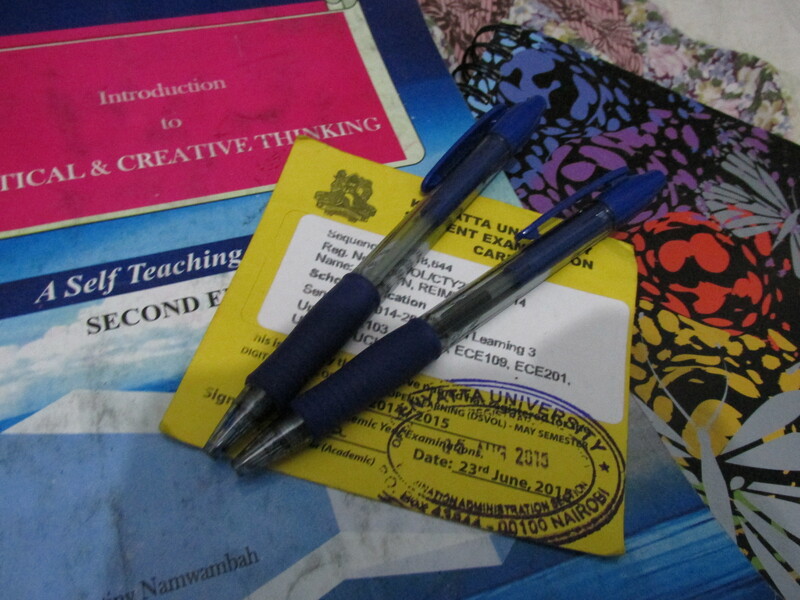 These days my exercise book, tablet, pen and I are becoming good friends, but they can’t do the exam for me. Same way in life, we have friends and family who love us, but when time comes for our exam, they are not permitted to enter the room. They are there for you in prayers and support. But there is one thing that is necessary to do the exam and that is your pen. When we as Christians are struggling and passing through hard times, we have a Father in Heaven who is with us and He will never leave us. In life, exams are inevitable, but we should not fear, because we are not alone. Oh, but in these struggles, I cannot forget the smiles of a young girl. Her parents died, leaving her and her sister to live with their grandmother Her sister was taken away, never to return. The grandmother and this young little girl were left to live in a small house. The first time I met this girl, she was shy and quiet. But as we continued to interact, things changed. We visited the home, and we were sitting and stories were being told in Kikamba. Children were crowing around me, and I started a conversation. This conversation turned into play, the language of a preschool child. We made a ball from some paper bags, and started playing. This girl’s walls came down. We laughed, and had so much fun. When I was leaving on the unimaginable road, i was smiling with a heart full of joy and hands that were filthy from dust, because I saw a miracle that day. God changes stories. In each one of these moments, that God takes me back to Psalms 121: 1 – 2. The only One that can help us is God, no man or friend can help us, like our Heavenly Father. These are a couple things that have been on my mind as I am doing my exams this week, and as we are waiting for our children to come back from home visits. Let us find our strength from God, because He will never change.